Whitehorse Leader were unable to print the correction I requested after the error in their article on 3 April 2013. However, Progress Leader have written a new article, without errors! "Aspergers is not a disease, it's not a defect - it is a difference in wiring in the brain that means people process information in a different way." My apologies to those offended by the misprint. Journalist Alana Rosenbaum from The Age contacted me in January when researching this article. She interviewed James, one of the case studies in my book series, for his views on the imminent disappearance of Aspergers as a separate diagnosis in the next edition of the primary diagnostic manual, the DSM-5. With the new DSM-5* due for release in May of this year, there has been much debate about the wisdom of the American Psychiatric Association's decision to drop Asperger's Disorder as a separate diagnosis. Instead it will be folded into a new diagnostic definition of Autism Spectrum Disorder. Media reports have ranged from outrage (New York Times 'New Definition of Autism will exclude many' Jan 2012) to more calm assessment of the facts (New York Times 'Report Sees Less Impact' Oct 2012). Clinical psychologists in Australia are also divided in whether they see the changes as being a logical response to the scientific evidence gathered over the last twenty years, or a pre-emptive lumping together of neurologically different conditions (Medical Observer 'Are there differences in Aspergers we are missing?' Nov 2012). Australian's Olga Tennison Autism Research Centre (OTARC) at La Trobe University Melbourne is the leading autism research organisation in our country. Last October they held a seminar 'Towards a New Definition of Autism' which explained the history of autism and Aspergers in the DSM. Due to overwhelming demand for places they have since held a webinar on 13 Feb 2013 to cover the same material. And now they have kindly made the full webinar available on their website, so you can personally view the slides and listen to our local experts explain the ongoing process of developing and refining the autism definition. I highly recommend you view the webinar yourself, rather than relying on sometimes sensational media reporting on this issue. Understanding DSM-5 is essential for parents and individuals with Aspergers to fully understand the complex issues behind this decision. Another reliable Australian source of information about Autism and Aspergers is Monash University's School of Psychology and Psychiatry. They've produced a range of resources available for free download. Click here to go to the Fact Sheets section of their website. *DSM-5 is the fifth edition of the American Psychiatric Association's Diagnostic and Statistical Manual for Mental Disorders, and will be published in May 2013. See www.dsm5.org for more. Dr Gerri Dawson, Chief Science Officer at Autism Speaks has written an easy to read summary of a talk given by Dr Sue Swedo, chair of the committee recommending changes to autism criteria for DSM-5, at the 2012 International Meeting on Autism Research in Toronto. According to this report, Dr Swedo has again confirmed that the American Psychiatric Association is NOT attempting to reduce the number of people diagnosed with an autism spectrum disorder. Rather they are trying to ensure all individuals are accurately diagnosed by strengthening the criteria and removing clincian's bias. By collapsing all subtypes into the one autism spectrum disorder it will improve the consistency of diagnoses. Currently this is an issue as what one doctor calls high functioning autism will be classifed as Asperger syndrome by another, depending on the recall of whether the person had a language delay or not. Asperger syndrome will not disappear, rather it will become a specifier or type within the autism spectrum diagnosis. Scientific research into Asperger syndrome will continue. And the addition of sensory sensitivites into the DSM-5 criteria is also to be welcomed. Autism Speaks, America's autism activisim and research organisation, has just released a report into their initial findings from the DSM-5 Field Trials. Determined to discover if the proposed new criteria for autism spectrum conditions (especially the removal of Asperger Syndrome as a separate diagnosis) would disadvantage those who currently have a diagnosis and therefore receive funding for services, the study has found that DSM-5 does NOT reduce the number of children who receive a diagnosis. On Wednesday 6th March 7pm you can hear about autism and Aspergers from a range of speakers, including yours truly! All parents are welcome to attend a FREE 1.5 hour information session where some of the leading Australian Nutritionists, Social Workers, Researchers and Clinical Psychologists will speak about structures which have benefited some families living with Autism/Aspergers and made a huge improvement in their standard of living. Lyndel Kennedy - Aspergers Syndrome Support Network Victoria and author of "The Hidden Diffability: Discovering Aspergers"
Donation: Gold coin donation on the night towards the venue hire and organisation. The Media Release is now available for The Hidden Diffability: Discovering Aspergers - click here to download it. If you're into gaming, or would like to get a taste for all the different gaming flavours out there, you might like to attend Pop Up Playground's Fresh Air Festival 2013, being held February 8, 9 and 10 at Fed Square Melbourne. There will be plenty of facilitators around to help you find your 'thing'. See their website for full details and descriptions. Best of all it's a free event, just come and register when you arrive! As well as purchasing your copy directly from me in person at Aspergers events in Melbourne, or via my website eStore, you can now ask your local Dymocks or Readings bookseller for a copy. Please support our locally owned and operated bookstores, and thank you guys for supporting local authors! School Readiness & Aspergers - It's Not Too Late! School readiness is a hot topic for all parents of kids heading to school for the first time. If you're parenting an Aspie though, it's an issue you need to address each and every year. Not only do you need to prepare your child for the challenges of a new teacher, new classroom, new classmates and potentially a new school environment, you also need to educate and prepare a new teacher, or set of teachers! Ideally the transition process began towards the end of last year, and you've already met your child's teacher/s for this year, and talked about your child's individual quirks. But if you've been away, busy, or whatever, there's still time to help everyone settle in quickly. For this list, I strongly believe - it's better late than not at all. Ring the school and make an appointment with your child's teacher for as soon as possible; preferably before the first day, but at least not later than the end of the first week at school. If available, ask to have the special education coordinator / integration aide / wellbeing officer / pastoral care person attend the meeting. And if it works for your family, involve the child as well, so they can talk directly and genuinely about their worries or preferences. This meeting should be the start of regular (at least once per term) student support group meetings, which you are entitled to if the school has been informed of the Aspergers diagnosis. Write or update a one page summary of your child's learning style, strengths, weaknesses and interests. Ask last year's teacher to email you a few pointers to share with future teachers. It always comes across better if the practical suggestions are from another teacher, and not just Mum or Dad! Ask to have your child's locker located at the end of the row, and on top if they are doubled up, so they have less sensory stresses when accessing their possessions - only one or two other kids to worry about, instead of two or four. Before all the kids are back and the place is overrun, take your child for a quiet walk around the school grounds, refreshing their memory of where everything is located, while you talk about strategies, or what to do, if your child gets upset, lost, or forgets what they should be doing. And don't forget to make friends with the admin person in your school's front office - they can become a great go-to person if all else fails, especially if they are forewarned about possible triggers and helpful actions if a meltdown does occur. For many kids the school librarian is also an important relationship to nuture. Sue Larkey's website has many tip sheets covering school and teaching issues. My next book, The Hidden Diffability: Aspergers at School, due for release late 2013, will go into much more detail on this topic, and show how the 15 Australian case studies managed all aspects of school life. Do we diagnose or identify? A new friend - a man in his 80s who was recently told he has Aspergers - asked me why I use the word 'diagnose' when talking about Aspergers. Given I'd just finished a speech about 'The Hidden Diffability: Discovering Aspergers' in which I spoke about Aspergers being a difference not a defect, he suggested that a better term would be to 'identify' a person with Aspergers, rather than 'diagnose' with it's ill-health connotations. Aspergers as a different way of thinking, seeing and feeling. It’s a difference in abilities, not defective, not diseased, and definitely not inferior. It’s just different. Everyone here tonight has some connection to autism, so you know how different and unique each person is. What works for one, won’t work for all. There is no universal ‘they’. My goal with The Hidden Diffability series is to give you insight into how diverse Australian families, including my own, have managed to combine the therapies and recommendations into a rewarding reality. I'd be really interested to know your thoughts on this idea, so please leave a comment below. Thank you David Pringle, President of ASSN, and Dr Richard Eisenmajer, Director of The ASD Clinic for your very kind words at the launch. To the ASSN committee and HazelNut crew, thank you for your great ideas, kindness and practical help on the night. Thank you to all my wonderful family and friends (both old and brand new!) for coming along to our ASSN Christmas party and book launch. It was a great night, which I hope will become an annual event for ASSN - well, the Christmas party side of it at any rate. Please join us for our final ASSN function of the year. All welcome. Dr Richard Eisenmajer, clinical psychologist, Director of the ASD Clinic and Patron of ASSN Victoria will officially launch Lyndel Kennedy's new book, The Hidden Diffability: Discovering Aspergers. Dr Richard Eisenmajer has a long history of working with clients on the autism spectrum, and is an entertaining and informative speaker. His DVD Imagine Having Asperger Syndrome – A First Consultation is popular with parents, educators, health professionals and individuals with AS. Lyndel Kennedy is a writer, researcher, editor and mother of three, including a teenager with Aspergers. She volunteers for ASSN Vic as parent support group facilitator and website curator. Speeches will be kept short to allow time to relax and socialise with Richard, Lyndel and other members of the local Aspergers community. Lyndel’s book is available as a paperback or Kindle eBook at www.hiddendiffability.com, Amazon and specialist bookstores. Signed copies will be available for purchase. State School principal Rob Casamento writes in today's Age newspaper about how parents should go about choosing a school for their child. While written for a mainstream audience - there's no mention of special needs - the advice is relevant for all. While attending open days, presentation mornings or evening sessions can be helpful, it is only by witnessing a school in action, on an ordinary week day, that parents can truly gauge the spirit and educational culture of the school. The question of 'what is a good school for my child with Aspergers' comes up often in our parent support group meetings. While Asperger Syndrome Support Network Vic has compiled a list of schools that may be suitable, nothing can replace the research parents do for their individual child. By all means ask questions about special education programs, NAPLAN and Year 12 results. But make sure that along with witnessing gyms, libraries, performance spaces and classroom dynamics, you also see how the children interact at lunchtime with each other and with staff, and pay a visit to the toilet block. As Rob Casamento writes, toilet maintenance can tell you a lot about a school! I'll be covering these issues in detail in my next book, The Hidden Diffability: Aspergers At School, to be published in 2013. If you are still deciding about where to enrol your child, I highly recommend you read Rob Casamento's article published in The Age newspaper on 9 October 2012, 'School Open Day Spin Just A Classroom Act'. On Grand Final Day 29 Sep 2012 I spoke on air with Rebecca Kelly, host of 'Real Peopl ASD Talk' radio show about my book The Hidden Diffability: Discovering Aspergers. You can listen to the podcast athttp://production72816.podomatic.com/. If you don't have time to listen to the hour long program, my interview starts at 32 minutes. Prior to talking with me, Beck Kelly also interviewed my ASSN colleague Margaret Kempner about bullying. Her segment begins at 11:30 minutes. TOWARDS A NEW DEFINITION OF AUTISM - A free forum presented by the Olga Tennison Autism Research Centre. To attend: register here. Bookings are essential. The fifth edition of the Diagnostic and Statistical Manual of Mental Disorders (DSM -5), to be published in 2013, is introducing significant changes to current diagnostic definitions of Autism and related conditions. In particular, with the introduction of the new diagnostic criteria, some of the diagnostic concepts that have influenced clinical practice, research studies, and cultural perceptions of Autism will no longer be used; most notably the concepts of ‘Asperger’s Disorder’, ‘Pervasive Developmental Disorders’ and the ‘triad of symptoms’. The Olga Tennison Autism Research Centre (OTARC) is holding a free public forum to discuss these changes. The forum is open to all interested people, including professionals and families. A 30 minute talk by Dr Giacomo Vivanti from OTARC outlining the changes. Responses from a panel including Professor Nicole Rinehart from the Clinical Psychology Centre at Monash University, Dr Janine Manjiviona, Clinical Psychologist in private practice with extensive experience in the diagnosis of Autism Spectrum Disorders, and Lisbeth Wilks, parent and a member of the OTARC team,OTARC researchers. To attend please register here. Bookings are essential. For additional information, email otarc@latrobe.edu.au or call 03 9479 2497 (Wednesdays to Fridays). 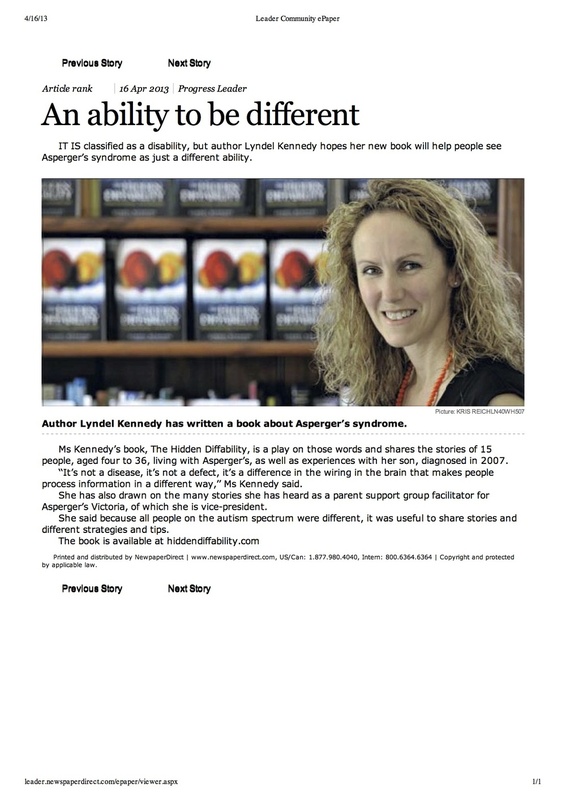 The Hidden Diffability: Discovering Aspergers by Lyndel Kennedy is now available both from this website and the Amazon online store. The first in a series of three books telling Australian stories of Asperger syndrome, The Hidden Diffability: Discovering Aspergers illuminates the misunderstood journey families face when a loved one is diagnosed with Asperger Syndrome. From the turbulence of diagnosis, the maze of therapies and funding options, the trials of finding the right schools, supports and advice, through to everyday success stories, Lyndel Kennedy has combined 15 family interviews with personal and professional experience and extensive research to provide a much-needed Australian resource. The Hidden Diffability: Discovering Aspergers enables parents, carers and individuals with Aspergers to share strategies and successes—you are not alone in the challenging journey along the Autism Spectrum. Part One: Discovering Aspergers covers the beginning of the Asperger journey, regardless of age: first signs, getting a diagnosis, sharing the diagnosis, presenting Aspergers to peers, current therapies and interventions, funding and support, and finally a look at the positives of being an 'Aspie'. It also includes an extensive glossary, full diagnostic criteria, and recommended reading and resources. Part Two: Aspergers at School covers the journey through the school years: finding a school, teacher training, modifying the curriculum, integration aides, frenemies, transitions between schools, camps and exams. Part Three: Everyday Aspergers covers the strategies that make a difference to daily living: sleep, food, medication, family traits, sibling skirmishes, anxiety, travel, sport, social attitudes, empathy, and finishes with a fascinating look at some very passionate interests. To purchase a copy of the ebook, click here to go to the eStore, or click here to go to the direct Amazon page. 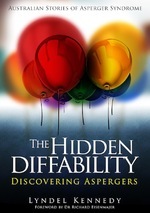 The Hidden Diffability: Discovering Aspergers is about to launch! In the next week The Hidden Diffability: Discovering Aspergers eBook will be available to purchase on Amazon.com This is the first book in The Hidden Diffability series of Australian Stories of Asperger Syndrome. Originally intended to be a single book, I've gathered so much great information over the last three years that it has grown too big to fit into one book. Based on market research and professional advice I've split the material into three areas: Discovery, School and Everyday Living. I'm working with a designer at the moment on the book cover, and my editor and I are making our final checks. I'll post here when the eBook is available, and again when the print version comes out. If you'd like to be notified of developments or further interview possibilities, please use the Email Me button. Click here to read The Hidden Diffability:Discovering Aspergers Chapter 1 Introduction. Dr Gerri Dawson, Chief Science Officer at Autism Speaks has written an easy to read summary of a talk given by Dr Sue Swedo, chair of the committee recommending changes to autism criteria for DSM 5, at the 2012 International Meeting on Autism Research in Toronto. According to this report, Dr Swedo has again confirmed that the American Psychiatry Association is NOT attempting to reduce the number of people diagnosed with an autism spectrum disorder. Rather they are trying to ensure all individuals are accurately diagnosed by strengthening the criteria and removing clincian's bias. By collapsing all subtypes into the one autism spectrum disorder it will improve the consistency of diagnoses. Currently this is an issue as what one doctor calls high functioning autism will be classifed as Asperger syndrome by another, depending on the recall of whether the person had a language delay or not. Asperger syndrome will not disappear, rather it will become a specifier or type within the autism spectrum diagnosis. Scientific research into Asperger syndrome will continue. And the addition of sensory sensitivites into the DSM 5 criteria is also to be welcomed. Autism Speaks, America's autism activisim and research organisation, has just released a report into their initial findings from the DSM 5 Field Trials. Determined to discover if the proposed new criteria for autism spectrum conditions (especially the removal of Asperger Syndrome as a separate diagnosis) would disadvantage those who currently have a diagnosis and therefore receive funding for services, the study has found that DSM 5 does NOT reduce the number of children who receive a diagnosis.